where you grow your own food, read a book in a lounge chair, play catch with your kids, have a candlelight dinner party, brush your hand up against lavender at the end of a long day at work, or…(insert your dream here). Everyone has a different vision of paradise. We will work with you to design a garden customized to fit your space and garden dream. Just as you have your own vision, you likely have your own way of doing things. After designing your garden, you have several options for how involved you want to be in its creation. Perfect for a balcony or patio, we will design and install a group of containers that works well for your space. We can also create unique modern terrariums and miniature gardens for your indoor garden. Kids love gardening. At least that's been our experience. Create a living playground and science laboratory for your budding naturalist. Do you dream of picking your own lettuce, heirloom tomatoes and butternut squash? Edible gardens come in all shapes and sizes and we can come up with the best design for your space and taste. Do you have one part of your yard you just haven't gotten to yet? Let us help you turn an eyesore into a mini paradise with a quick Leelee's Garden makeover. Maybe you just moved in. Or you have an idea for your front and back yard and just don't know how to make it happen. 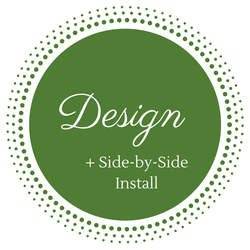 We can help design and install your entire home oasis. Whether you want to pick strawberries in a backyard berry patch or make an English Garden out of you front yard, we can make your vision come alive. We will meet with you for a consultation, create a preliminary design, and work from there to build the landscape of your dreams. With our network of subcontractors, we will make sure every element of your outdoor space is completed to exceed your expectations. "Leann is amazing! We had a tiny backyard and a front yard with almost zero sunlight. Leann designed our yard taking into account our budget and each family member's biggest desires for the space. Now we have a fire pit, a wildflower area, a vegetable garden and a whimsical easy to care for front yard. Not only that, but Leann worked with my 13 year old son on the entire project which proved to be a fantastic learning experience for him. Thank you so much Leann!" "Leann was great to work with. She was very helpful with all the questions I had. She included all the features I wanted in our project and incorporated them very well. She brings all the supplies for the project too which is great. She has a good knowledge of plants and materials. I would highly recommend Leann to anyone no matter what the project is big or small." Want to get your hands dirty and learn about your garden as you create it? Let's have a garden party! After we finalize the design, I will bring all of the plants and materials to your home to install your garden with just you or a whole family. Are you a do-it-yourself kind of a person? After our initial consultation, you will receive a custom design, plant list, material list and tips for building your garden. You can schedule additional coaching as needed. Contact Leelee to learn about pricing and additional information.